The atheist (@justfole) who has more names than Lucifer responded to my Christmas challenge. I responded back. My words are in black and his are in blue. I accept @sacerdotus' Christmas Challenge wp.me/p2MYpO-2V, albeit a little late. ////Here I will be responding to the challenge set forth by the person known only as Sacerdotus. I recently “debated” him on the idea of whether “god” could be definitively proved or disproved. I assume the debate ended in a draw, as nobody was declared the winner. I don’t care, I don’t do this for the fame and glory, I do it because it entertains me, and hopefully entertains and/or educates anyone who happens to come across it. Although fame and glory would be nice. Not to be arrogant, but it is obvious that I won the debate. :) You were not able to counter my arguments. I appreciate the time you took to take this Christmas challenge which other vocal atheists did not even try to engage. From Dawkins to Harris, even caricature account Rubicondior; none attempted to take the challenge. The questions are indeed valid. As a matter of fact, they originate from a discussion I had with a former professor of mine during Christmas vacation when I visited. The questions seek the truth regarding the accusations against Christ. There is nothing illogical about this. If someone were to claim that you are not who you say you are, you will do all that there is to do to prove your identity. How can this be illogical? 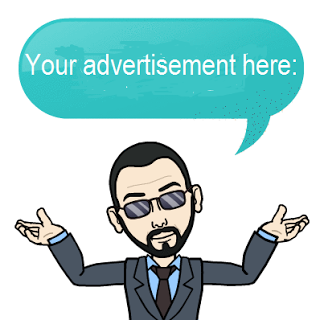 Nevertheless, it is not uncommon for atheists to call "disingenuous" those questions that dissolve atheism and its claims. These questions have nothing to do with the definition of atheism, but on its claim that Christ is a myth. 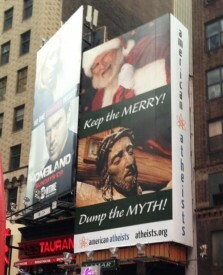 Around Christmas time, atheist organizations pay lots of money to place billboards claiming that Christ is a myth. Here is one put on in NYC's Time's Square. Moreover, if atheism does not provide answers to the origins of the universe or life etc, then why disqualify God as a causal possibility? The dismissal of God indicates that one has knowledge of how it all started otherwise God would not be left out of the equation. /////You are to prove with evidence that Christmas is indeed a myth and that no such person named Jesus Christ was born or existed which instigated the formation of the world’s most powerful religion. Since this challenge was addressed to atheists, I will respond first from the perspective of an atheist, then I will address the specifics of the question. This is not about believing or not believing. 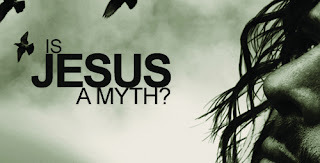 It is about classifying Christ and Christmas as a "myth." There are religious individuals who believe in Christ, but do not believe in the "Christmas narrative." The intention of the questions is to sort out fact from fiction. It is not about believing or disbelieving in the matter. Christmas is more than a national holiday, it is an event that concentrates on history's most important figure: Jesus Christ. The questions are not addressing the secular holiday aspect of it, but its origin - whether it is factual or not. This is not about customs or rituals that secular society has placed on the celebration. It is about the origin and veracity of the celebration. If one can trace a person to an author, then it is indeed possible to prove that said person did not exist. For example, if someone were to ask if Ichabod Crane was real or not, the answer would be no. If asked for evidence, the response would be the mentioning of Washington Irving's "The Legend of Sleepy Hollow." In regards to evidence of Jesus, there are indeed sources outside of Christianity that give witness to Him. These are some: Tacitus, Pliny the Younger, Josephus, The Babylonian Talmud, Lucian. In addition to this, the witness of the Gospels and early Christians are taken seriously by scholars even today. Even the most anti-religious or secular historians accept that Jesus Christ did walk this Earth. The dispute among most secular scholars is whether or not He was Divine. As demonstrated above, evidence exists that a man named Jesus Christ who founded Christianity walked this Earth. Yes, there were some who called themselves "Messiah," but none had the success that Jesus had. This is testament to the veracity of Jesus' claims. The Messiah in order to fit that description had to present certain qualities about Him. Jesus obviously fit the mold and was believed. Had He been a fraud, Christianity would have died out in its infancy alongside all the other sects. Scholars have long debunked claims of similarities made by anti-religious folks. No historian takes seriously the claims that Christ is a borrowed mythology. While these gods are said to have a birthday on December 25th, one must remember that it was the Catholic Church that designated the 25th as Christ's birth in order to facilitate the conversion of Pagans. Some believe Jesus was actually born in March. Also, the calendar that we use today was not used by those who wrote on these gods, so the December 25 birth claims for them are not accurate. If there is no originator or origin of the Christmas myth, then you have publicly declared it to be an historical event. If the person and events surrounding Christmas were indeed a myth, then you would have been able to trace it to an author just like I traced Ichabod to Irving. ///You must explain why this myth was so powerful that it spread globally as Truth and is taught in university curriculum in history and theological departments. It wasn't? It is a federal holiday in the United States. The one and only religious federal holiday I might add. This means a lot considering that the United States is clear in regarding any endorsement of religion by its government. The fact that it is taught in many history and theology departments indicates the veracity of it. There are no "Greek Divinity schools" or curriculums that prepares students for ministry in Greek or Roman pagan mythology. ///You must explain why this myth is still relevant 2000 + years later. Christmas is fun? Studies show that Christmas or the holidays triggers Season Affective Disorder. People become depressed, stressed, some even commit suicide. The burden of buying presents for all and wondering if they will enjoy them; plus the stress of shopping in stores, deceased family members who are no longer present, the deployment of a loved one to war, or even nostalgia bring people's mental state down. Nevertheless, Christmas is still relevant. So relevant that atheists feel the need to launch campaigns against it. ///You must explain how billions have encountered this mythological being named Christ and how this person has worked miracles in their lives if He never existed. This one is even easier than the last. Short answer: they haven’t and he hasn’t. First of all, he wasn’t named “Christ,” that was his title. Christ means “the anointed one.” It wasn’t his name. They haven't? So people never experienced God? Never had prayers answered? What rock have you been living under? I invite you to conduct a survey. Visit any churches of whatever denomination and ask them if they have experienced Jesus. Any experience can be subjective, but when large amounts of people have it, then there is something more to them than subjectivity. Miracles can occur to anyone, not just Christians. There is only ONE God listening. 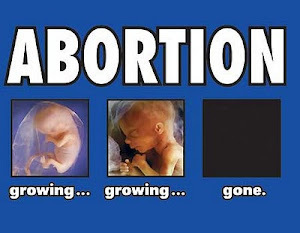 The miracle happened for a reason. Miracles usually occur to convert. A miracle is not as trivial as you attempt to describe it. In order for a miracle to be miracle, the laws of nature/physics must have been suspended and the event defies all we know about existence. that my government name, and you could say I have 2 names. My online pseudonym, and my real life name. place, so objectively, no winner could be declared. one dismantles the opponents arguments. A close analysis would show that you failed to show that God does not exist or is not possible. so that they would be impossible to legitimately answer. of this god, and I don’t believe anyone who claims they do. That is atheism. “I don’t believe you.” That’s all it is. Atheism has many divisions under its umbrella. The survey I am conducting currently shows this. Not all atheists think the same. Some claim with confidence that there is no God whatsoever, others claim that they do not know whether God exists or not. Some say that God might exist, but not in the way religions define Him. However, this challenge is not about atheism, but about the idea that those who represent it pay money to display on billboards - "Christmas is a myth." The dismissal of one explanation indicates knowledge of the matter because in order to make this conclusion, the evidence must have been analyzed first. For example. If I say that there is no way that OJ Simpson killed anyone, then I am speaking because I know something that is filtering my judgement which forces me to make this conclusion. Decisions cannot be made without prior knowledge on the matter being decided upon. I cannot choose to go left without knowing there is a right. A lack of knowledge of what right would change my perception of what left is. Similarly, I cannot know what cold is without experiencing its contrast. offers quotes that support this. explains who the Christians are and what they believe. A historical account does not need to be an autobiography in order to be a valid source. Historians during the time of Washington or Lincoln did not need to be near them 24/7 in order for their accounts to have value. The quotes provided mention Jesus. Tacitus mentions Christ as suffering at the hands of Pontius Pilate. This is an account of an individual and what occurred to this individual at a point in time (reign of Tiberius). Pliny the Younger describes how early Christians worshiped Christ. Notice that Pliny the Younger calls Christ by that name and does not infer that Christ was a myth or legend. He is obviously aware that this Christ was seen as a God among men. As a magistrate of Rome, he had to give a report to the empire. This report had to be done carefully and accurately. Again, no scholar negates the authenticity and validity of the Gospels as historical documents. They have been proven to be worthy of historical study, not just religious. Mark is the oldest Gospel and was written around 60 AD. One of the reasons why the Gospels don't date earlier is because the early Christians believed in the "parousia" or the second coming. They did not find a need to document the events so soon if the end was coming soon. any such claims of divinity. narrative and are dismissed. The challenge does not mention secular customs that were added to the holiday. automatically confer the same description to all holidays. refers to the holy day the Catholic Church celebrates. It is not referring to the commercialized christmas with Santa Claus, snowmen, wreathes, trees, presents and all those things. This is why you are confused. Santa Claus, trees, decorations, snow men, carols etc are irrelevant to this challenge. The challenge deals with the historical event that is celebrated on Christmas - the birth of the Son of God to a Virgin. and the wreaths and the eggnog and the abominable music? disingenuous almost every time we interact. lived. As I’ve already made clear, this is irrelevant. Are you serious? The events surrounding Christmas are the birth of Christ, the manger/cave, shepherds, wise men etc. The tree and other things are secular additions. These have nothing to do with the events surrounding Christmas anymore than a birthday cake has to do with you coming out of your mother. example. If a biologist whose studies focus on evolution states that he/she found evidence that the first phase of evolution took place on Jan. 1 and that day is New Years for most of the world; eventually that date will become associated with the "first phase of evolution." This is what the Church did. They took a date that pagans celebrated (remember pagans outnumbered the Church at the time) and transformed it into a different celebration which expedited conversion. In regards to Ichabod Crane: Did Washington Irving make any disclaimers regarding said individual? If not, then the suggestion that Ichabod Crane could be a fictional character based on a real person is fallacious and unfounded. This is the typical Reductio ad absurdum fallacy. The difference between Christ and Crane is that the latter is known to be a fictional character. This character exists specifically to entertain the plot of the story. Christ is different. Christ walked and lived among human beings. No one ever called Christ a myth until the 18th century via the inferences of David Strauss. Again, no scholar would make the suggestion that Christ was a mythological character. The Vedas is known to originate from folk culture and was passed down orally using literary devices. They are not of divine origin. Hindus do not believe them to be the "word of Krishna." The Vedas are in a sense, a collection of philosophical and allegorical concepts based on what the people who wrote it learned as they matured in life. religion or prohibiting the practice of any religion. making is more difficult for other religions to practice. Regardless, let’s go with his logic here. The United States government will not endorse any religion. Christmas is a federal holiday in the United States. I think that is clear enough. The US government cannot endorse any religion as its own. The government cannot state that Judaism, Christianity or Islam is its official religion. You misunderstood my argument, please reread it. I never said the establishment of the holiday was establishing Christianity as the official religion. There are no ministries? 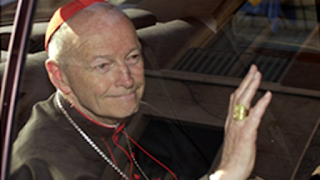 The Catholic Church has never had ministries?? Really?? Where have you been my friend? Again, you missed my point... The fact that theology departments exists shows that academia takes these faiths seriously. Christianity, Islam, Judaism have real founders. They are not religions that came together from fables or stories. These are actual historically significant faiths that can be traced to a real individual who walked the earth. Whether or not they teach truth is not relevant to this discussion. No university will have courses that will teach Greek or Roman beliefs in the same way it teaches Christianity, Islam or Judaism. We know Zeus, Jupiter etc are myths. This was part of the challenge. If Jesus is not real and is a myth, then who the heck do people experience in their lives? This is a more blunt way of asking. Coincidence? The math doesn't add up when applying it to cases of answered prayers and its frequency Studies by Dale Matthews and Sally Marlowe show otherwise. The findings showed healing after prayer was done. To psychologists it is. Psychologists need to learn of these experiences in order to study the phenomenon It may not be proof to you, but to social scientists, they are. When I say personal experiences, I mean the spiritual life of the person, not visualizing certain persons. Well think of it this way. What are the chances that Leonardo Da Vinci and "John Doe" will paint the Mona Lisa at the same exact time, in the same exact manner? If there were more than one God, there would have been multiple "big bangs" instead of one originating from a SINGULARITY. Your analogy with Christ and Hindu gods is ridiculous. 1) Hindu gods are known to originate from folk religion. 2) Jesus Christ was an actual man who lived among us and founded the Catholic Church upon Peter the Rock. Are you serious? Miracles happen all the time. Visit Medjugorje and you will actually see them. Had you lived in St. Padre Pio's time (60's), you would have seen the miracles God performed through him. Visit the shrines around the world where the Blessed Mother appeared and see for yourself the miracles.